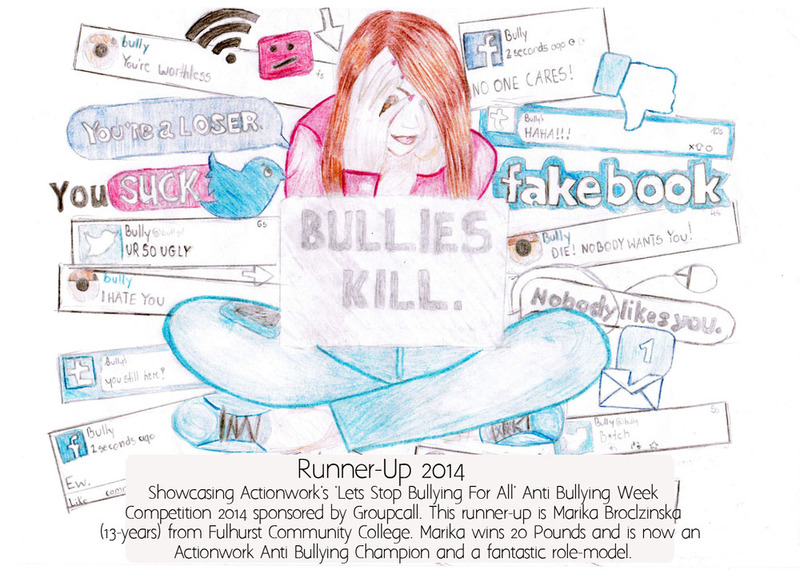 Actionwork® Anti Bullying Week Competition 2014 sponsored by Groupcall. Winning entries. See the winning 2013 entries here. Groupcall have sponsored the competition in 2013 and 2014. 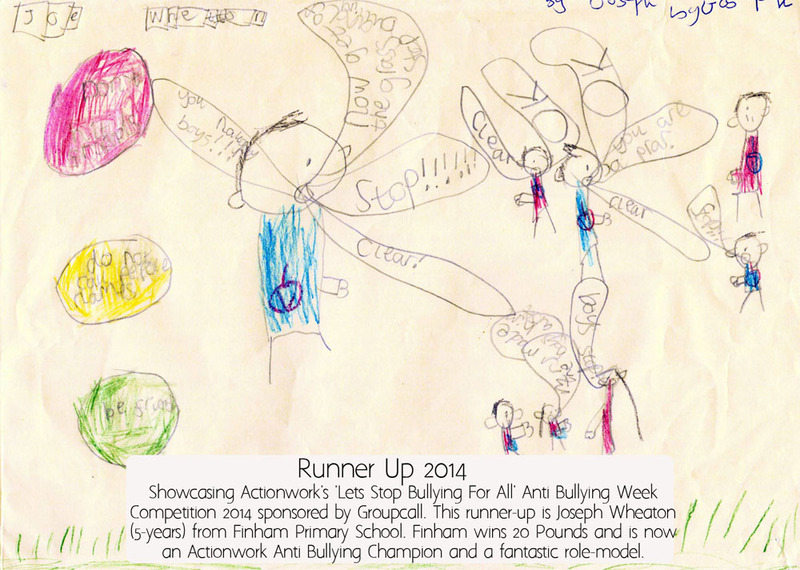 Groupcall said: "We were delighted and honoured to sponsor the Actionwork® Anti-Bullying Week Competition. It is really interesting to see all the wonderful entries from so many schools across the country. Groupcall’s BATline helps to eradicate bullying in schools and we appreciate that getting the right message across to schools is so important – something that Actionwork® do tremendously well – keep up the good work"
In 2014 we had over 2800 entries from young people all over the UK and abroad that included films, pictures, poems, stories, gadgets and cartoons. The youngest entrant was 5-years old and the oldest was 17-years old. We would like to thank everyone for getting involved and for the fantastic entries received. The judges (which includes young people) decisions have been very hard. We have chosen 1 winner, 1 2nd place and 5 runner-ups all of whom recieve cash prizes. All of these finalists entries are shown below. We will be showcasing other entrants throughout the year and will be compiling many of them in our magazine Empower You. Our winner in 2014 is 16-year old Romy Sammon from Newcastle College in Newcastle-Upon-Tyne. She has won £150 for herself and £150 for her school. 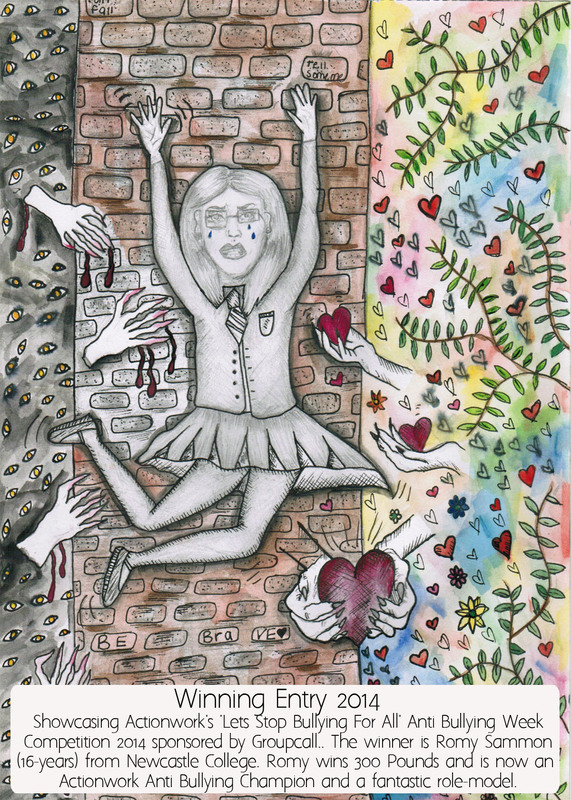 The judges felt that her picture not only encapsulated the theme of the competition but was also original, graphically excellent and made you think about the issues involved including those of helplessness and positivitee in reaching out for help. The Director of Actionwork®, Dr Andy Hickson, will be presenting Romy with her prize in due course, photos of the day will be showcased here soon. In the mean time see her winning entry below. Below we have showcased the top 7 entries starting with our winner Romy Sammon from Newcastle College. Winner: Romy Sammon who wins £300 (split 50/50 with her school). 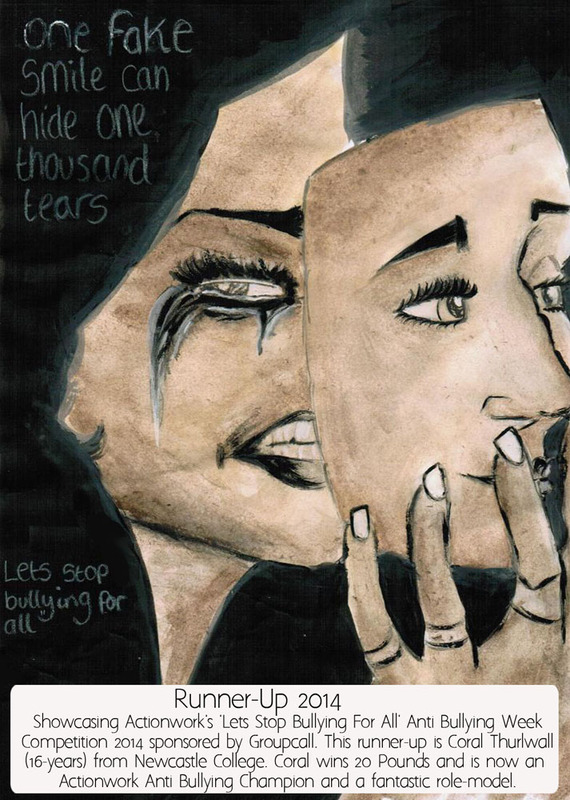 Second place went to 9-year old Sophie Welch with the film 'Let's Stop Bullying For All'. Sophie wins £75. 14-year old Pippa Dugan and her song 'Walk Away'. Pippa wins £20. 11-year old's Alex Weedon and Joe Knox with their film 'Weedon Anti Bullying'. They win £20 between them.